You are currently browsing the archives for the Jeff Johnson category. Apparently, Councilman Libert hasn’t figured it out that he had a responsibility to monitor primary resettlement in St. Cloud. Thankfully, he’s been relieved of those responsibilities. Libert said Johnson’s “bashing of St. Cloud State” during his tenure on the council was the “dumbest thing in the world. What you’ve got to do is say, ‘St. Cloud State, we know you’ve got some enrollment issues but we’re here. What can we do to help you?’ We can hold our hands out and our hearts open,” Libert said. Paul Brandmire defeated Libert this past election. I’m confident he’ll make smarter decisions than Libert did. Jeff Johnson’s clarifying editorial is likely Councilman Johnson’s final official statement on the issue of refugee resettlement. During this fight, others on the City Council have mischaracterized the local government’s rights. Further, they’ve lied about the volunteer agencies’ affirmative responsibilities. In his editorial, Councilman Johnson wrote that “Lutheran Social Services is supposed to have quarterly meetings with constituents, which has been hit and miss at best. When they do have their quarterly meeting, they simply ‘inform’ the participants after refugee placement occurs.” How does that comply with the Refugee Act of 1980? Talk about strawman arguments. Councilman Johnson never said that consultation was the same as consent or the right of approval. Further, Councilman Johnson never hinted that he’d encourage the St. Cloud City Council to sue the federal government. I’m not surprised by Mr. Aurelius’ comments and questions. Liberal commenters often ‘hear’ questions that were never asked. Why shouldn’t Mr. Aurelius hear something that wasn’t asked this time? This isn’t the first time it’s happened. Based on the language of the bill, it’s clear that local officials have been given an important responsibility in the refugee resettlement program. It’s equally clear that the City Council’s responsibility is limited to a consulting role. Still, that’s an important role considering the fact that the federal government is essentially dumping another unfunded mandate on the cities. Perhaps unfunded mandate is too strong. Underfunded definitely isn’t too strong, though. The aldermen eventually wrote to the U.S. Department of State protesting the plan and opened an investigation into the mayor’s actions. Looking into refugee resettlement isn’t unconstitutional, especially when Sen. Ted Kennedy wrote into the bill that required the State Department to talk with local units of government before the fact. That’s called collaboration. That’s the opposite of unconstitutional. It doesn’t require the federal government to relinquish its authority of setting immigration policy. It doesn’t require city councils to be silent ‘victims’ of federal overreach. Instead, it requires both levels of government to work together. I’d love hearing Mayor Kleis explain how that’s unconstitutional. Finally, what Councilman Johnson proposed was a resolution that proposed a moratorium. He didn’t propose an ordinance requiring a moratorium on the refugee resettlement program. Since when is it unconstitutional for city councilmembers to state their opinions on federal policies? When it comes to “listening to both sides,” it is quite clear that Brandmire is the one not listening. 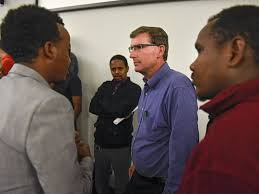 I suggest he go back and read Kleis’s comments for reference, and review the statements made by council members about previous attempts to limit refugees moving to St. Cloud. There have also been local events that specifically addressed the costs, though it’s clear from his column that cost is not the real issue – culture is. Councilman Johnson’s resolution dealt strictly with primary resettlement. It didn’t (and couldn’t) deal with secondary resettlement. It would be wise if this person actually paid attention to what was actually discussed instead of worrying about straw-man arguments that were never made. 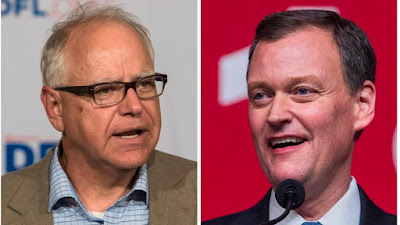 Friday night, Tim Walz tried being the ‘I’m all things to all people’ candidate during his debate with Jeff Johnson on Almanac. On one of the first questions, Walz talked about single-payer health care being where most people finally arrive at. Then Walz went into a long-winded spiel about how preventive care drives down health insurance premiums, which is why we need single-payer. That’s true. I wrote about the DFL’s single-payer bill in this post. That bill has 31 coverage requirements for each policy. Think of it this way. It’s the ACA except that it’s totally run by bureaucrats. After the rollout disaster of the ACA, that can’t sound appealing. I spent 24 years on national security and numerous trips to the border to actually witness how we do security in-depth and how we do it electronically and with surveillance. Every sovereign nation has the right and the need to control its borders but the issue is about stoking fear and telling us we’re not stronger because of immigration. It doesn’t matter what your plans are. The next governor of Minnesota must have the capacity to bring people together to solve problems. Immigration has always been an issue that has bound us together and what we see is this fear of telling people that they are in danger instead of coming up with real solid plans like comprehensive immigration reform that passed in the Senate but was never heard in the House. Notice that Walz criticized President Trump, criticized House Republicans, tossed out the Democrats’ favorite go-to phrase on immigration but didn’t actually tell the moderators whether he’d advocate for turning Minnesota into a sanctuary state. Eventually, Walz admitted that he’s for turning Minnesota into a sanctuary state before lying about what a sanctuary state or city is. Walz denied that description, insisting that violent felons would go to prison. That isn’t at question. What’s at question is what state law enforcement officials would be allowed to do when these violent felons are released from prison. I highly recommend you watch the entire debate. Tim Walz was all over the place. Jeff Johnson’s answers were short, concise and actually fixed problems. WJON’s debate featuring incumbent John Libert and challenger Paul Brandmire was quite instructive. It exposed Libert as being mean-spirited and willing to attack people who weren’t there to defend themselves. Here’s what happened. During the debate, Mr. Brandmire said that he didn’t like how the Council treated Jeff Johnson when he proposed his moratorium resolution. Mr. Libert replied by saying that Councilman Johnson’s resolution was a PR stunt. Attacking someone who isn’t there to defend themselves is just mean-spirited. Further, Mr. Libert isn’t even close to the truth. First, calling a resolution illegal and unconstitutional is BS. I’d love hearing Mr. Libert’s explanation telling me what part of the Constitution Councilman Johnson’s resolution violates. Further, Councilman Johnson notified the Council that he’d bring up the resolution at a future City Council meeting as new business. There’s nothing improper about that. Third, Councilman Goerger’s resolution was brought up for the first time the night it was voted on. It was an ambush. Period. People weren’t given the opportunity to read Councilman Goerger’s resolution. Thanks to Councilman Masters calling the question, discussion of Councilman Goerger’s resolution was extremely limited. Clearly, the Council didn’t want to discuss the issue. That’s proof that Councilman Johnson’s criticism that this wasn’t a transparent process was accurate. Frankly, Libert is a spineless politician who doesn’t have an ounce of integrity. It’s time to fire him next Tuesday. It’s pathetic that the St. Cloud City Council incumbents are using their supporters to spread fear to defeat their challengers. A perfect example of the incumbents’ fearmongering is this LTE that the St. Cloud Times published. What a pile of BS. First off, saying that these candidates are trying to divide citizens by getting them to “buy into inflated crime statistics” is reprehensible. Those statistics came from the FBI. Does this writer want me to believe that I shouldn’t trust the FBI? Next, I don’t remember any LTEs written after Jeff Goerger teamed with #UniteCloud in pushing his ‘welcoming community’ resolution without advance notice. That resolution was written to belittle the resolution that Councilman Jeff Johnson’s resolution. Masters, Laraway and Libert each voted to undercut Councilman Johnson. There wasn’t any advance notice given by Goerger. Councilman Johnson gave the Council 2 weeks advance notice. I’d call Laraway, Libert, Goerger and Masters predators but that’s too good for them. There’s only 2 members of the City Council that actually listen to their constituents: Jeff Johnson and George Hontos. The rest of them only listen to the special interests like the Chamber of Commerce, UniteCloud and Lutheran Social Services. It’s rich that people that only listen to the special interests are considered uniters but those that actually listen to their would-be constituents are considered dividers. BTW, John Palmer, Liz Baklaich, Paul Brandmire and Mike Conway are each running on an agenda of economic development and law and order. Finally, this LTE has the tone of a typical UniteCloud smear job written all over it. UniteCloud specializes in smearing people rather than debating them on a substantive basis. Traditionally speaking, Tim Walz’s running mate is Peggy Flanagan. From an agenda standpoint, though, Tim Walz’s running mate is Keith Ellison. If either of them or, God forbid, both are elected, Minnesota will become one of the worst states in terms of crime and illegal immigration. Minnesota has a proud immigrant tradition, from those seeking economic opportunity to those fleeing violence abroad. As Attorney General, I will fight efforts by the Trump Administration to remove protections from DREAMers who contribute so much to our economy and society. I will ensure that our immigration detention system is humane, and free from mistreatment, and will prioritize efforts to reunite families who were heartlessly separated at the border. I will stand up to the un-American, discriminatory Muslim Travel Ban. Our country is at its best when we welcome those fleeing horrendous conditions, not when we fan the flames of bigotry and division. If Tim Walz and Keith Ellison are elected, it’s certain that Minnesota’s crime rate will head in the wrong direction. Kessler rightly highlights the fact that immigration is a hot issue for the GOP base. That’s why I expect Jeff Johnson and Doug Wardlow to highlight this issue as much as possible through Election Day. Follow this link to contribute to Jeff’s campaign. If you want a safe Minnesota, follow this link to contribute to Doug Wardlow’s campaign so he can protect Minnesota while finishing Keith Ellison’s political career. If you’re a fiscal conservative, it’s impossible to vote for DFL politicians. DFL politicians are the opposite of fiscally conservative. According to the 2017 Taxpayers League Scorecard, the worst scores House Republicans got were 60s. The best score that a House DFL politician got was a 67 by Jeanne Poppe. That 67 is an outlier, though, because Poppe’s lifetime score from the TPL is 16. If Johnson wants to vote DFL this year, that’s his right and privilege. That being said, he’s kidding himself if he thinks he’s a fiscal conservative. I’d put him in the Arne Carlson/Dave Durenberger wing of the Republican Party. In other words, Johnson appears to be a perfect fit into the RINO wing of the MNGOP. President Trump is popular among Minnesota Republicans, but Johnson says he can’t support what the President stands for. He won’t vote for his former Hennepin County Board colleague Jeff Johnson for governor, or his friend Erik Paulsen for Congress. He says he cannot trust they will ever stand up to President Trump. “I think it’s time for Republicans, mainstream, real Republicans, to stand up and say ‘enough is enough,'” Johnson said. Let’s compare Trump’s agenda with President Reagan’s agenda. Both cut and reformed taxes. Both cut regulations significantly. Economic growth exploded during their administration. Both rebuilt the military. Johnson approved of President Reagan’s agenda. Why doesn’t he approve of President Trump’s agenda? In the interview, Johnson says that he didn’t leave the Republican Party. That’s BS. If he’s voting for a straight DFL ticket this fall, that’s proof he left the MNGOP. He can spin it whichever way he wants. The truth is that he isn’t a fiscal conservative. However, he might be a ‘Never Trumper’. Jeff Johnson trails Tim Walz 47%-44% and Karin Housley trails Tina Smith by a 46%-43% margin. I can’t say that I’m surprised with those results. In fact, I wouldn’t be surprised if the DFL loses both of those seats. I’m not ready to predict GOP victories in those races — yet. That’s similar to my position on the MN AG race, where I think Keith Ellison keeps sinking each week. If Democrats don’t retake the House or the Senate, that will be a crushing blow going into the 2020 cycle. At this point, it’s safe to scrap the ‘blue wave’ myth. It doesn’t exist.